Uranus has twenty-seven moons that orbit it as it travels through on its path around our sun. One of the more exciting moons that orbit Uranus is called Miranda. 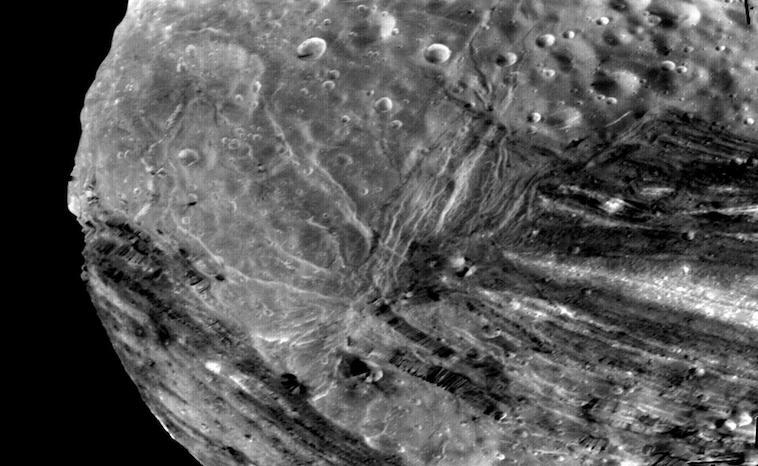 It is the innermost moon and marked by grooves called ovoids. In 1948 Gerard Kuiper discovered the icy moon and named it from a character in Shakespeare’s The Tempest. What do we know about this unique moon? In 1986, Voyager 2 flew past and captured the first images. Scientists were surprised to see the surface of the moon. It did not look like anything else they had seen in the universe. Why? Aside from the icy surface, it had terrain features with deep ridges and odd shaped rock formations. Furthermore, there were huge faults, deep canyons, steep cliffs, smooth plains, and curiously shaped rifts. Astronomers once believed that Miranda had been shattered to pieces and reassembled several times throughout its long history. In addition, recent theories suggest that areas of partially melted ice may be responsible for these curious surface features. The temperature of this icy world averages just -335 F (-187° C). Miranda has no detectable atmosphere and no magnetic field. “Miranda has a really bizarre, deformed surface,” Noah Hammond, a planetary scientist at Brown University in Rhode Island. The moon also has the tallest known cliff in the Solar System, Verona Rupes, which is 3-6 miles (5-10 kilometers) in height. Earth’s moon is 86% bigger in diameter than Miranda. The grooves on the surface are called ovoids. Scientists believe that the ovoids may have been created by internal heat a long time ago. This heat rose up and created currents of ice that deformed the crust. Scientists have counted the ovoids on the moon. They conclude that the entire surface is indeed old and no longer active. Where did the heat come from to make the ovoids? Miranda’s small size means that it probably cooled quickly after its creation. Furthermore, it does not have the radioactive material that Earth possesses. The Earth’s radioactive material keeps the inside hot. Researchers believe that the gravitational pull of Uranus may have distorted Miranda. This distortion may have led to heating inside the moon. This would explain the formation of the ovoids. We see other planets gravitational pull have a great impact on their moons. The moons near Jupiter cause shifts as much as 90 feet. This shifting makes enough heat to cause volcanic eruptions. In 2022, scientists will gather to determine what planets will be good candidates to visit for future space exploration. Uranus is one of the planets in the discussion. We hope to see another visit to Uranus and the Miranda moon.